Although what�s inside black holes remains a mystery, superheated matter on the verge of being swallowed radiates some clues about the nature of its captor. Recent observations from NASA�s Chandra X-ray Observatory reveal that magnetic fields may be responsible for black holes� continuous consumption. This discovery provides the key to understanding the growth and ultimately the evolution of black holes, according to the University of Michigan�s Jon Miller. 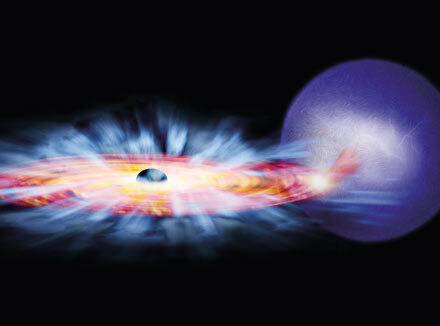 Chandra observed GRO J1655-40, a black hole in a binary star system 10,000 light-years away. In this system, one star has collapsed into a black hole and is pulling matter from the other star into an accretion disk around itself for eventual ingestion. Although the black hole remains undetectable, the matter it is stealing radiates as it spirals inward, sharing important information in its dying breath. If gravity were the only force at work in J1655�s disk, matter would simply orbit, rather than spiral into, the black hole. For the disk�s material to be pulled inward, and therefore radiate energy, another force must affect the disk, Miller said. X-rays from J1655�s disk provided the spectral fingerprint that identified a magnetic field as the other force. By studying the amount of X-rays coming from J1655�s disk at various energy levels, Miller and his team determined the speed and density of the wind aiding the X-ray emission. These numbers corresponded to a computer simulation of magnetically driven winds, leading to the conclusion that a wind driven by a magnetic field must be aiding J1655 in its consumption by slowing the material in disk. Which Came First, the Galaxy or the Black Hole?